What would happen if four NBA hall-of-famers and Nick Young decided to move into the same suburban neighborhood, leave their families, and become best friends? Obviously, one of the first things this group would do would be to go Trick or Treating. From Lebron, the royal lion, to Kobe, the irritated black mamba, these personalities would stomp through the neighborhood talking trash to each other, collecting 25/5/5 at each house: 25 Skittles/ 5 Snickers/ 5 Butterfingers. 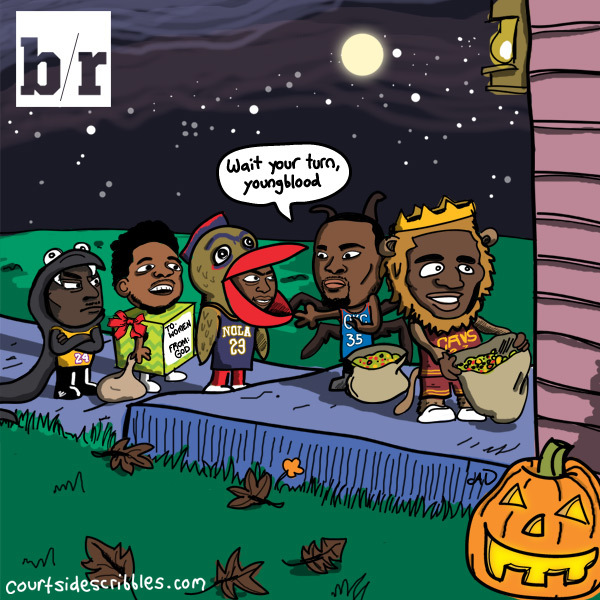 Durant and Lebron would steal candy from Anthony Davis. Little Anthony just wants to play with them. Just let him play with you Lebron!! Real life bleeds into this comic. One of these players is dressed accurately. That Halloween, Nick Young decided to dress up as Swaggy P: Gods Gift to Women. Literally, he boxed himself up with a big red bow. Of course he did.